Your toddler will have fun learning their colors with this caterpillar theme color sorting activity. 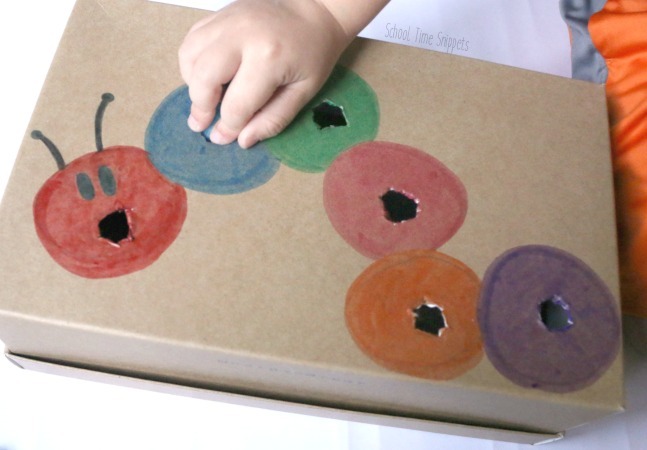 This playful, hands-on color sorting activity is a great way to sneak in fine motor control, and as caterpillars are a sign of "all things new," this toddler activity is perfect for spring! With our Insect I SPY printable last week, we are going "buggy" again with this Caterpillar theme color sorting activity for toddlers. 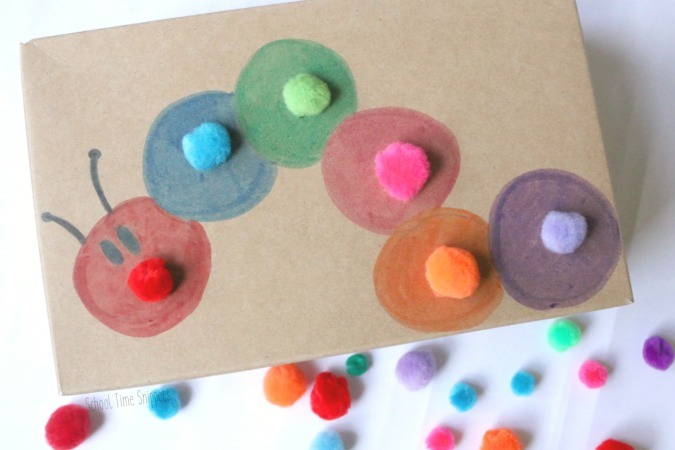 Use this activity to talk about colors, count, and work on strengthening fine motor skills! 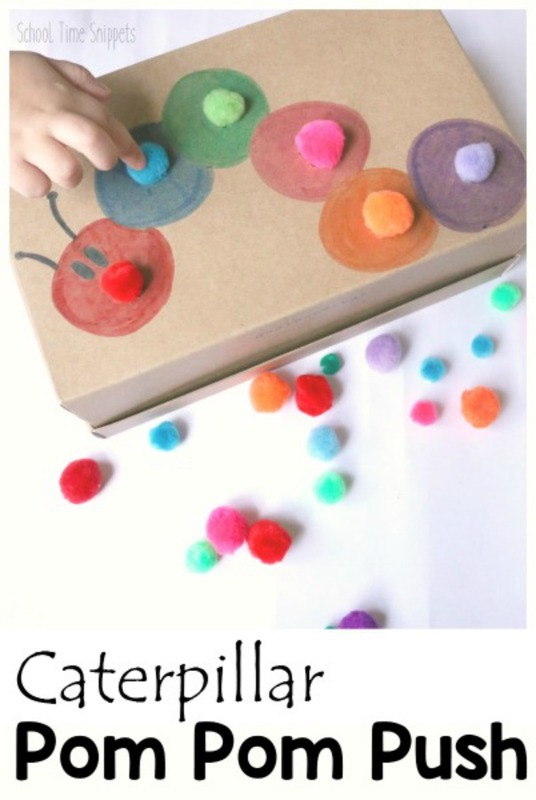 For more fine motor skills ideas, you also might love our popular Very Hungry Caterpillar Story Printable! Or if you are a fan of Hungry Hungry Hippo Game, you might like our much quieter caterpillar version! I've been so focused on working with Big Sis and Big Brother that the two little ones (2 and 4 years) are often found around the house playing nicely with whatever toys they can get their hands on... or making a mess of everything. So I decided to make a little something for them in mind! It sneaks in learning concepts and is cute to boot! If you create learning themes for your littles, this activity would fit perfectly with other caterpillar and/or spring themed learning ideas! 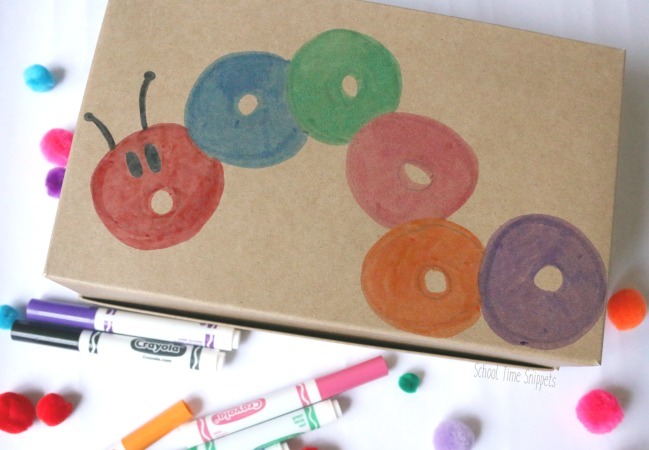 And adult will first need to prep the activity by drawing out a caterpillar on the shoe box. I drew out six circles for the caterpillar body-- each circle will be a different color. Add more or less if you'd like. 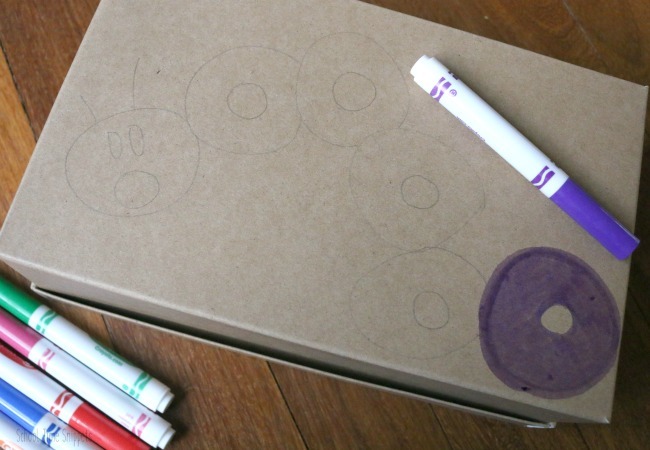 Using a set of markers, color in each circle. Crayola markers worked really on the brown shoe box, however you could also use paint . I left a little circle uncolored-- that would be the part for me to cut out with a knife. I added two eyes and two antennae to the face of the caterpillar. Once the caterpillar is all colored, use a knife to cut a small hole in the middle of each caterpillar. My circles were less than perfect, and that's okay if yours are, too. The holes just need to be big enough to push a pom pom through. My 4 year old got a chance to play with it first and had a great time pushing the pom poms into each hole. At first I presented the activity by placing a colored pom pom on top of each hole and he pushed them in. Then he began to pick up colors and push them in himself. We talked about colors, counted, and more importantly he worked on strengthening his fine motor skills! It did take a little bit of prep from me, but nothing too involved! And the end result turned out to be a super cute and fun learning activity for my toddler and preschooler! Pom poms are a so fun to play and work with! After playing with this caterpillar activity for a few minutes, we had an explosion of pom poms all over the floor. I'm not sure what happened! Ha! Nonetheless, it was a fun and simple way to use materials we already had on hand to create a cute color sorting activity for my little ones! Looking for more hands-on "spring" theme activities for your 3-5 year old?! Take a look at our Spring Preschool Unit Lesson Plans! 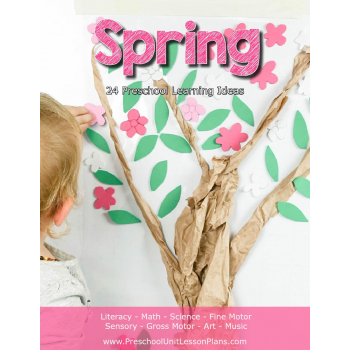 Get ready for fun and learning with preschool unit lesson plans for Spring. This thematic unit is packed with literature based activities that are easy to prepare and fun to implement. Using several well-loved Children's Literature selections, your child will make connections in math, reading, fine motor skills, art, sensory play, and more! through hands-on SPRING theme activities!